On How To Activate The Same Formula In Your life So You Can Live The Life Of Abundance God Said You Could Live!! 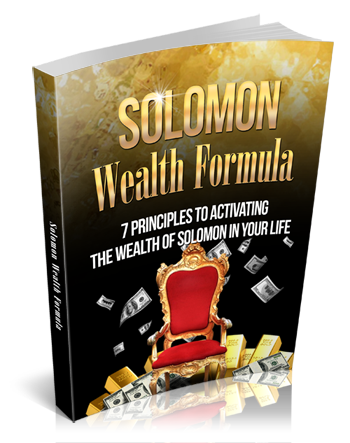 Introducing The "Solomon Wealth Formula"
7 Principles to Activating The Solomon Wealth Formula in your life! Are You Living The Abundant Life God Said You Could Live? I believe it has nothing to do with what we lack inside us, but has everything to do with us not knowing what to do. Aside from that, once we know what to do, do we Take The Necessary Actions to get it done. Hi, my name is Kelly Cole. I'm humbled to say I'm a Minister, #1 Best Selling Author of a book called "Conversations With Sharks" Secrets Shared From ABC Shark Tank, I'm also a very successful entrepreneur & businessman. I’am also married, with three kids. Although I have been blessed with a healthy income, it wasn’t always this way. I started out as a guy who worked 2 jobs to support his family. I worked at Walmart in the day time and Blockbuster Video at night. Spending all of my spare time, energy and money (which wasn’t very much – LOL) trying to find what I was suppose to be doing. I Praise God Now because I was blessed enough to find my passion of helping people live their dreams and make a Living Doing So! This revelation about Solomon I’m about to share with you came to me while I was studying a lesson to teach my Sunday school class. I wanted to share some type of inspiration with my students that would motivate them to do something different in the New Year that they had never done before. I wanted them to actually look at their lives and ask themselves the question I asked you at the beginning of this letter, am I really living the abundant life God said I could live? If they answered no to that question, I then would ask them asked them why not? Have you buried your talent, have you dismissed your gift God has given you? While searching my spirit and the word of God for the answer and or a solution I could share with them, the Lord dropped in my spirit Solomon. The reason that scripture came to me was I remembered that all the people that came to hear Solomon’s wisdom, they didn’t come empty handed they brought him a gift of some kind. Now let’s relate that to today’s time. The people paid Solomon to consult them on what they needed help with or what they needed an understanding about. So I wrote down to share with my class that one of Solomon’s income streams was consulting! I would just ask them what specialized knowledge they had, then enlighten them on the fact that they could charge people to consult them. Just as I was about to close my bible the Lord said read the whole chapter of 1 Kings 4. As I began to read, I was blow away and about fell out of my chair! I said to the Lord, "Its All Right Here!" "The Formula Of How Solomon Built his Wealth is right here!" I then began to give God praise for the revelation he had just given me. The next day, I went to Sunday school taught my class the lesson and shared with them everything the Lord revealed to me. Many of them were just BLOWN AWAY & Left my class Inspired to begin a new life. A couple days later I got a call from a great friend of mine, as we begin to talk the Lord told me to share with him my revelation about Solomon. I did just that, as I began to share with him the revelation...He cut me off and got so EXCITED and said to me "Kelly this message needs to be shared with the world!" I politely told him, thanks for the suggestion but that I didn't think I would do so. He said to me "Kelly, you have too, This message will change alot of people's lives." I him told that I would pray about it, and get back to him. Well the following week, this same friend invited me to teach his class the revelation the Lord gave me about Solomon. The response I received was over whelming! At that point I knew I had to at lease put this revelation into book form. 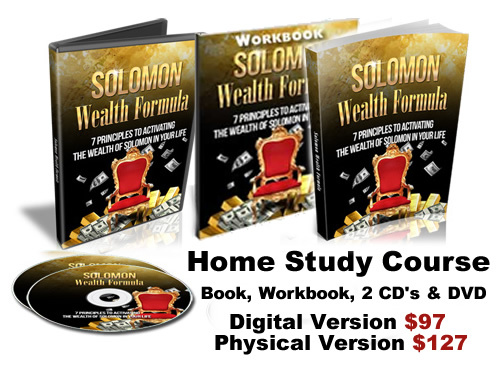 "Here are the 7 Principles and here are the 12 steps to activating The Solomon Wealth Formula in your life! I was at a loss for words, I knew the Lord had given me the keys to a new life of abundance! I also knew I couldn't just keep it to myself, I had to share it! He showed me exactly what Solomon did to activate Great Wealth, how he did it and how you can apply it to your life. 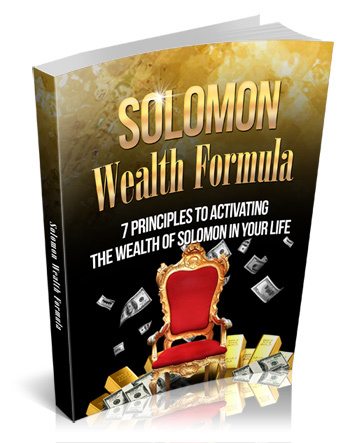 For Instance below are the 7 Principles to Activating The Solomon Wealth Formula in your life! In the book I go into great detail about each Principles! Plus He also showed me exactly what to do after you activate the principles. and get the things done to live an Abundant life just as Solomon did. I promise if this book don't change your life and your perspective and how the Lord wants you to live, I don't know what will. This book is the blueprint to you achieving everything you want out of life. ORDER Your Copy Today and you will receive some Amazing Surprise bonuses Valued at over $300!! After you read the book you will understand way I chose that price! YES! Kelly I Am Ready To Change My Life and Live Abundantly! Order Now and you will receive the book and Over $300 worth of AMAZING Bonuses! WAIT I almost forgot, I also created a Home Study Course that is Available in 2 Different Formats! A Digital Version that includes -The Book & Workbook in eBook format, 2 Audio MP3 Training's & a Video Training Available for Download Now! and a DVD Training which will be shipped to your door! TAKE ACTION NOW, Because Tomorrow Never Comes, What You Don't Do Today, Does Not Get Done! P.S. I promise this book will change your life, Remember Order Now and you will receive Over $300 Worth Of BONUSES!